A typical day at the reinvented B&B program usually includes a good morning hug, a healthy meal, time with an individual tutor and the reward of game time. • A Healthy Meal: Each morning we offer a source of protein, multiple fresh fruit options and low sugar cereals. Hard-boiled eggs, oatmeal with fruit and whole-wheat bagels are just some of the options on the menu. we served over 10,800 healthy morning meals. • Daily Academic Focus: Each morning children work with a tutor on homework or reading. This daily commitment builds strong academic habits and builds the student’s confidence in their ability to succeed. • Relational Connections: Each morning a diverse team of tutors (Northwestern students, teachers, parent and community volunteers) provides social and emotional support in addition to academic help. Tutors spend time building relationships with individual students and affirming the child’s deep value and potential. Lack of access to affordable summer programming is a consistent trend for many families involved in Books & Breakfast. With the help of generous funders and a partnership with the YWCA, for the past 2 years B&B students have been able to participate in the B&B Summer Book Club and the B&B Summer Swim. 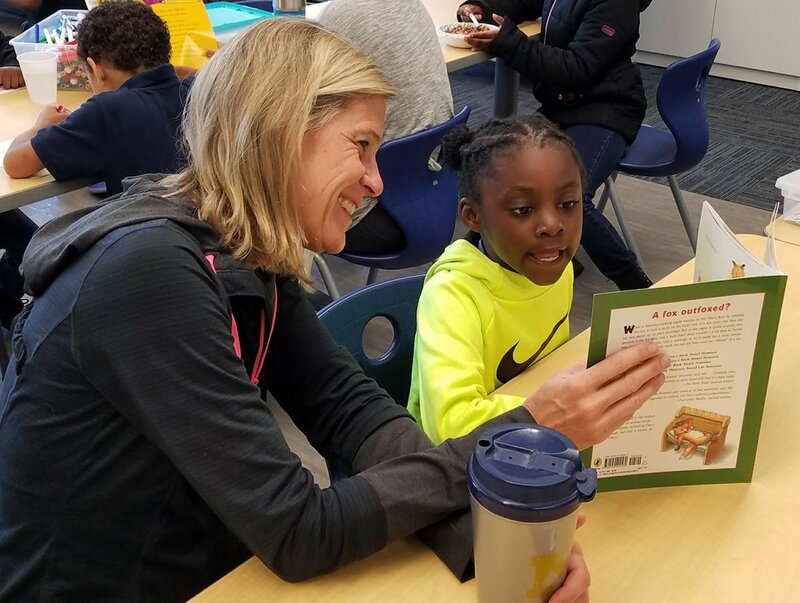 Books & Breakfast started over 30 years ago when parents and school leaders at an Evanston elementary school recognized a need for breakfast and decided to act. At Dewey Elementary, B&B began in the early 1990's and lasted for over 20 years through volunteer efforts alone. Faced with dwindling volunteer support in 2012, a decision was made not to cut the program but to reinvent it. In addition to the morning meal, B&B made a commitment to providing a daily academic boost from caring and supportive tutors. In order to sustain this new level of holistic supports, Books & Breakfast became an independent non-profit in July of 2013. Currently hundreds of Evanston students do not have access to a morning meal or homework help in their local school. Books & Breakfast fills this gap with a healthy meal, academic enrichment and a personal connection that encourages and affirms a student's belief in themselves. Building Strong Learners. Building School Communities. Building Learners: Each day we work with students to build them up as learners. We focus on building strong relationships with tutors and build student confidence around homework and reading. Building Community: B&B builds connections with the local school community and draws additional Evanston resources to the local school. We partner regularly with teachers, parents, the PTA, Northwestern University and many other Evanston organizations.